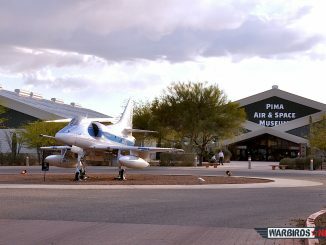 The NASA Orion traveling exhibit at Pima Air & Space Museum during June 2011. 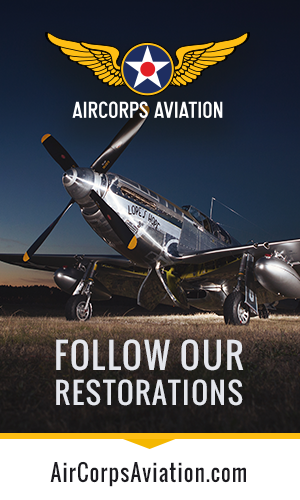 Photo by John Bezosky Jr.
PRESS RELEASE – Dec. 1, 2014–Tucson, AZ. 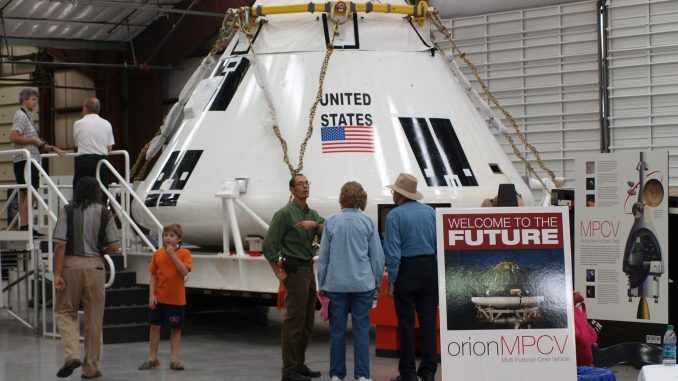 NASA selected Pima Air & Space Museum as the area’s Simulcast Splashdown partner for its first venture outside the earth’s protective magnetic field in 40 years: the Orion EFT-1, on Thu., Dec. 4, 2014. Although an unmanned flight, 174 Tucson-area locals are considered virtual-crew members because their names are on board the spacecraft. These virtual crew members “trained”/took the NASA Exploration Design Challenge during the Titan Missile and Pima Air & Space Museums’ summer Saturday evening programs (Moonlight MADness and Night Wings, respectively), or the Pima Air & Space’s Soarin’ Saturday programs. 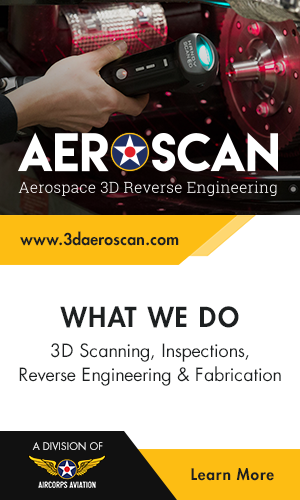 A list of the local virtual crew members is attached but can also be found on the Pima Air & Space Museum website at http://pimaair.org/images/PDFs/NASA_2014_OrionEDC_VirtualCrewMembers.pdf. all included in the price of admission. The celebration will be held even if the launch is postponed. Larry Price, the Deputy Orion Program Manager from Lockheed Martin, is available for telephone interviews from Florida (where the Orion is being launched from Cape Canaveral Air Force Station). 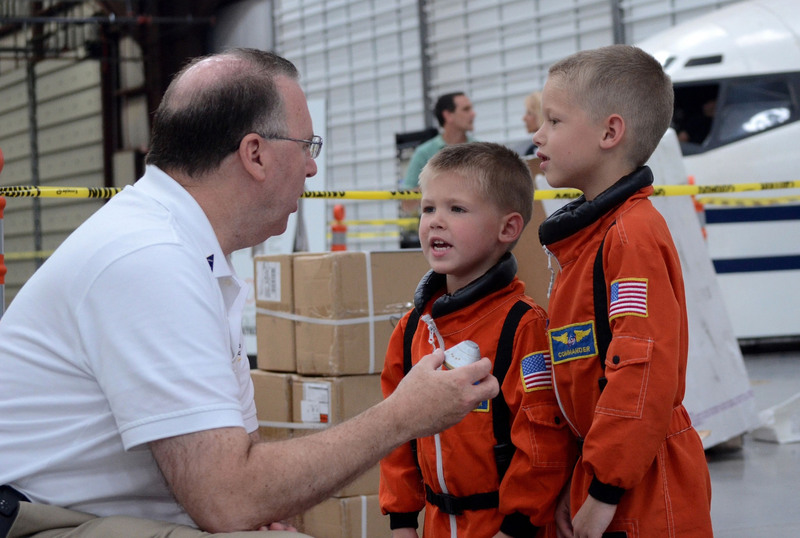 Brothers and future astornauts Galeb (4 years old) and Aiden (7 years old) Mann discuss Orion’s journey with a Lockheed Martin team member. Photo by John Bezosky Jr. The purpose of the Orion mission is to send a manned crew to Mars by 2030. 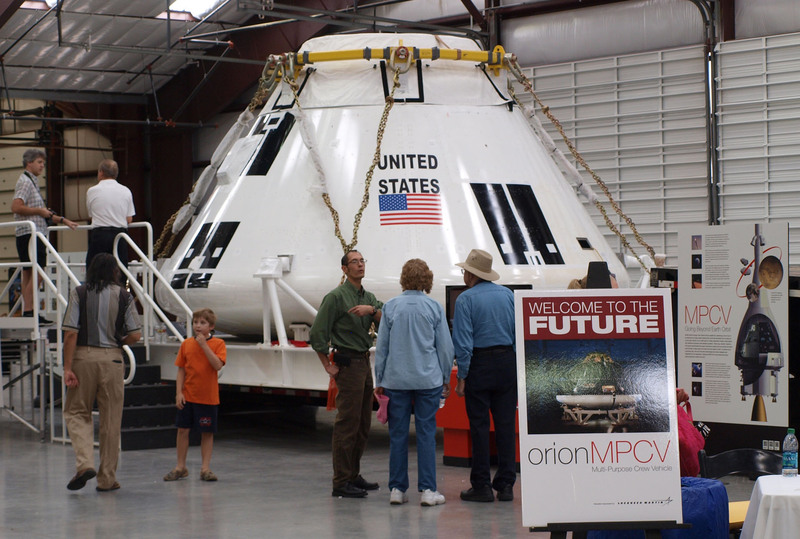 An Orion MPCV (multipurpose command vehicle) was introduced to the Tucson area at a temporary museum exhibit in 2011. An Orion mockup, heading to San Diego for ocean-rescue maneuvers, “vacationed” at Pima Air & Space last winter (from Dec. 20, 2013 until Jan. 2, 2014) during which time Lockheed Martin Deputy Orion Program Manager Larry Price spoke at the museum. To learn more about Orion and Exploration Flight Test-1, visit http://www.nasa.gov/orion.